Pulmonary surfactant is a surface-active lipoprotein complex (phospholipoprotein) formed by type II alveolar cells. The proteins and lipids that make up the surfactant have both hydrophilic and hydrophobic regions. By adsorbing to the air-water interface of alveoli, with hydrophilic head groups in the water and the hydrophobic tails facing towards the air, the main lipid component of surfactant, dipalmitoylphosphatidylcholine (DPPC), reduces surface tension. This is a phospholipid with two 16-carbon saturated chains and a phosphate group with quaternary amine group attached. The DPPC is the strongest surfactant molecule in the pulmonary surfactant mixture. It also has higher compaction capacity than the other phospholipids, because the apolar tail is less bent. Nevertheless, without the other substances of the pulmonary surfactant mixture, the DPPC's adsorption kinetics is very slow. This happens primarily because the phase transition temperature between gel to liquid crystal of pure DPPC is 41.5 °C, which is higher than the human body's temperature of 37 °C. Researcher John Clements identified surfactants and their role in the 1950s. Dr. Mary Avery would soon after show that the lungs of premature infants couldn't produce surfactants. Until recently, Exosurf, Curosurf, Infasurf, and Survanta were the only surfactants FDA approved for use in the U.S. In 2012 the US FDA approved an additional synthetic surfactant, lucinactant (Surfaxin). Lucinactant contains the low-complexity 21-amino-acid peptide sinapultide (KL4 acetate), 1,2-dipalmitoyl-sn-glycero-3-phosphocholine, 1-palmitoyl-2-oleoyl-sn-glycero-3-phosphoglycerol (as the sodium salt), and palmitic acid. Discovery Labs, the manufacturer of Surfaxin, elected to cease commercialization of Surfaxin in 2015, to focus on a new generation product, Aerosurf, currently in phase IIa clinical trial. Even though the surface tension can be greatly reduced by pulmonary surfactant, this effect will depend on the surfactant's concentration on the interface. The interface concentration has a saturation limit, which depends on temperature and mixture composition. Because during ventilation there is a variation of the lung surface area, the surfactant's interface concentration is not usually at the level of saturation. The surface increases during inspiration, which consequently opens space for new surfactant molecules to be recruited to the interface. Meanwhile, at the expiration the surface area decreases, the layer of surfactant is squeezed, bringing the surfactant molecules closer to each other and further decreasing the surface tension. SP molecules contribute to increase the surfactant interface adsorption kinetics, when the concentration is below the saturation level. They also make weak bonds with the surfactant molecules at the interface and hold them longer there when the interface is compressed. Therefore, during ventilation, surface tension is usually lower than at equilibrium. Therefore, the surface tension varies according to the volume of air in the lungs, which protects them from atelectasis at low volumes and tissue damage at high volume levels. 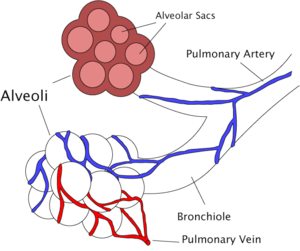 ↑ "Alveoli and the Breathing Process". Retrieved 2013-10-30. ↑ West, John B. (1994). Respiratory physiology-- the essentials. Baltimore: Williams & Wilkins. ISBN 0-683-08937-4. ↑ Wright, Jo Rae (2004). "Host Defense Functions of Pulmonary Surfactant". Biology of the Neonate. 85 (4): 326–32. doi:10.1159/000078172. PMID 15211087. ↑ Albon, Norman (1978). "Nature of the gel to liquid crystal transition of synthetic phosphatidylcholines". Proceedings of the National Academy of Sciences of the United States of America. 75 (5): 2258–2260. doi:10.1073/pnas.75.5.2258. PMID 276866. ↑ Hills, B. A. (1999). "An alternative view of the role(s) of surfactant and the alveolar model". Journal of applied physiology. 87 (5): 1567–83. PMID 10562593. 1 2 Schurch, S.; Lee, Martin; Gehr, Peter; Qanbar, R; Schürch, S (1992). "Pulmonary surfactant: Surface properties and function of alveolar and airway surfactant". Pure and Applied Chemistry. 64 (11): 209–20. doi:10.1351/pac199264111745. PMID 11369545. 1 2 Possmayer, Fred; Nag, Kaushik; Rodriguez, Karina; Qanbar, Riad; Schürch, Samuel (2001). "Surface activity in vitro: Role of surfactant proteins". Comparative Biochemistry and Physiology A. 129: 209. doi:10.1016/S1095-6433(01)00317-8. 1 2 3 Veldhuizen, Ruud; Nag, Kaushik; Orgeig, Sandra; Possmayer, Fred (1998). "The role of lipids in pulmonary surfactant". Biochimica et Biophysica Acta (BBA) - Molecular Basis of Disease. 1408 (2–3): 90–108. doi:10.1016/S0925-4439(98)00061-1. PMID 9813256. 1 2 Schürch, Samuel; Bachofen, Hans; Possmayer, Fred (2001). "Surface activity in situ, in vivo, and in the captive bubble surfactometer". Comparative Biochemistry and Physiology A. 129 (1): 195–207. doi:10.1016/S1095-6433(01)00316-6. PMID 11369544. ↑ Palca, Joe (3 August 2015). "How A Scientist's Slick Discovery Helped Save Preemies' Lives". NPR. Retrieved 3 August 2015. ↑ Taeusch, H William; Lu, Karen; Ramierez-Schrempp, Daniela (2002). "Improving pulmonary surfactants" (PDF). Acta Pharmacologica Sinica. 23 Suppl: 11–5. ↑ Discovery Labs, Inc. "Press Release". ↑ Crowther, J. E.; Schlesinger, L. S. (2005). "Endocytic pathway for surfactant protein a in human macrophages: Binding, clathrin-mediated uptake, and trafficking through the endolysosomal pathway". AJP: Lung Cellular and Molecular Physiology. 290 (2): L334–42. doi:10.1152/ajplung.00267.2005. PMID 16169899. ↑ Neergaard, K. (1929). "Neue Auffassungen über einen Grundbegriff der Atemmechanik" [New views on a fundamental concept of respiratory mechanics]. Zeitschrift für Die Gesamte Experimentelle Medizin (in German). 66 (1): 373–94. doi:10.1007/bf02621963.